Arrival at Cochin Airport, meet and Greet by the representative of Green Kerala Tour then proceed to Athirappilly, Athirappilly Waterfalls is located at the entrance of Sholayar ranges, the major host town is Chalakudy, this waterfall is one of the major picnic spots of Kerala. Affording to the onlookers, one of the most bewitching sights, Athirappilly water Falls is 80 feet high and located exactly in the forest area. Combined with the natural greenery. Over night stay at resort. Following breakfast, you can start the full day sightseeing in Munnar. 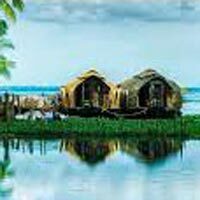 Visit - Mattupetty Lake & Dam, Echo Point, Kundale Lake, Blossom Garden, Rajamalai, Eravikulam Wildlife sanctuary a top peak of Munnar where you can see Neelgiril Thar (mountain goats), tea gardens and tea factory. Overnight stay in the resort. After breakfast start the journey to Thekkady- drive through panoramic western ghat, that hills covered with spice plantations and occasional view of waterfalls and streams boating through Periyar lake - South India’s most popular wild life sanctuary, its home to bison, wild elephant, boar, languor, the great Indian tiger and more. Overnight stay at resort / hotel. Optional : Elephant ride, Trekking, boating etc. Following breakfast proceed to Kochi, here we can visit St. Francis Church, the oldest Church in India, 500 year old Portuguese Houses, and Cantilevered Chinese fishing nets, 16th century Synagogue, Jew Town and Mattancherry Palace, built by Portuguese. Over night stay at hotel.